It’s been said that Colorado is the perfect place for adventurers as it has a little bit of everything for everyone. The spirit of adventure is deep inside a person’s soul, and some of us strive to achieve the ultimate adventure in every aspect of our lives. Sometimes we seek it in our jobs, our hobbies, our choice of partners, and even in our vehicles. Chevrolet, classic American automaker, has managed to interpret a sense of that sought-after adventure into each and every one of their vehicles, especially their compact pickup truck, the Colorado. Since 2004, Chevrolet has been producing this compact pickup to evoke the true spirit of Colorado; adventuresome and outdoorsy. Any truly useful pickup truck is capable of transporting your best friend’s apartment contents or the new bedroom set you’ve picked out as newlyweds, but it also should be able to be your everyday means of transportation. Not only should you be able to help a friend move, carry a load of groceries, or haul the contents home to build a new patio, but your entire family should be comfortable as well. A pickup truck is usually thought of as a solitary vehicle, but the Colorado is ready for anything life throws your way. Armed with a 3.6L V6 engine, the Chevy Colorado has the power you need in a truck, but the estimated 26 miles per gallon is the icing on the cake, coming in very close to some sedans for highway mileage. 305 horsepower will get this truck where it needs to go and will haul up to 7000 pounds. 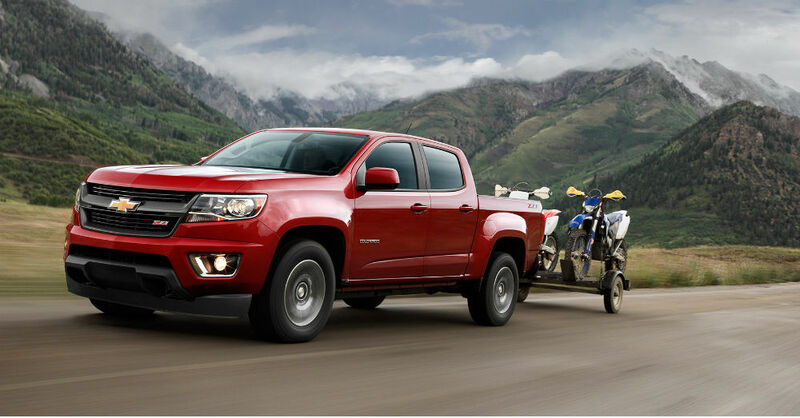 The first truck in its class to have optional aero shutters, to control airflow and aerodynamics, the Chevrolet Colorado is packed with other groundbreaking features including a system that stops the flow of gas to the engine when the truck is braking. While the exterior of the truck is capable and well-equipped to handle all of your personal and professional needs, it is also well-appointed inside the cabin. Chevrolet has taken major strides to ensure the quietness of the interior so both the driver and their passengers can truly enjoy the ride. When it comes to seating, the Colorado is available with cloth or leather interior that is cushioned and shaped for maximum comfort, and also includes a generous amount of leg room in the rear seats. This pickup also breaks molds by providing a maximum amount of storage space inside the truck, including multiple USB ports for charging all of your devices. Chevy didn’t skimp on technology when they designed this truck either. They’ve added the capability for mobile WiFi, garnering more accessibility than even your cell phone. The Colorado also includes Chevy’s MyLink and 8-inch infotainment system that allows for customization based on the most-used features. MyLink makes it possible for the driver to make calls, control radio stations, and receive turn by turn directions all from one command center. With steering wheel controls, Chevrolet couples safety and technology. Speaking of safety, always an important concern in any new vehicle, Chevrolet maximizes the welfare of both you and your passengers. Protecting the people in the car every step of the way before, during, and after an accident, the Colorado is equipped with a multitude of safety features that are both standard and optional. There is a backup camera that comes standard in every truck to increase visibility behind you and allows you to see almost everything. There is also a collision alert system that is constantly vigilant in its assessment of the road ahead, looking for stopped cars or slower traffic. The truck itself is constructed using a steel cage to absorb excess impact in the event of a collision, and has all of the standard air bags, allowing you to rest at ease when traveling with your most precious cargo. The Colorado isn’t just another pretty face, it is both form and function, and comes in two special editions as well. In the Gear On Special Edition, it is manufactured to offer the greatest number of possible cargo storing options with its customizable system. In the Z71 Trail Boss edition, everything you need to take your truck off-road is standard, providing an option for an escape from the straight and narrow. If blacked-out is your favorite style, the Midnight Edition is a perfect fit. Equipped with black grille, emblems, and wheels, the Midnight Colorado is the perfect way to show off your dark side. Whether you’re hitting the trail for a camp out under the stars, heading to your construction job site, or making your way to the board room, the Colorado is ready to get you there. No matter where your destination, this pickup is well prepared to make your drive a little bit more adventurous and a lot more fun. Comfortable enough for the whole family, and well suited for just you, the Colorado gives off that rocky mountain high vibe.